James Morrison’s goal – After a goal-mouth scramble, the ball is played back in, and it falls to Morrison who is unmarked on the penalty spot; he guides his shot low into the corner. Brunt’s corner is floated in, and headed away by Gallas, who is competing with McAuley. The ball is retrieved by Rosenberg, who intelligently plays it back into the box early. McAuley has pulled off at the far post, untracked, and heads back into the danger area. Lukaku leaps impressively and heads goal-wards, but why is Friedel not doing everything to meet McAuley’s looped header? Lukaku is a big man, but goalkeepers have the advantage of being able to go with both arms raised – he should be looking to claim this, or at least punch it away. Fortunately for Friedel, Gallas has dropped back on to the line, and gets it out, with Bale hooking clear. Note Morrison at the bottom of the screen grab, having just run past Walker, approaching the edge of the box. The ball doesn’t travel too far, and Brunt heads intelligently back into the box, where Spurs have not picked up their men. Walker hasn’t tracked Morrison at all, and a number of players are sucked towards the ball. West Brom have three players unmarked in dangerous areas. Vertonghen gambles and doesn’t meet the bouncing ball, and McAuley helps it on. It falls to Morrison, near to the penalty spot, with Walker yards away, only now realising his error. Morrison’s shot is guided intelligently into the corner – he doesn’t need to put too much power on it, and just focuses on hitting the target. Walker´s and BAE´s laps of concentration cost to Spurs a couple of goals against them every season. Until a coach will get busy to solve that problem, Spurs will suffer some bad results and waste of points. 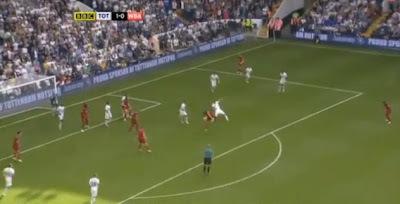 In the lead up to the goal, 3 Spurs players were actually going for Brunt on the left and they didn't even notice that - worse still, they weren't even aware that they were actually vacating the center zone where a few other WBA players, including Morrison, were waiting to pounce. Unbeleivable, it was identical to the goal scored by Demba ba in that they were unmarked. so many goals spurs conceded in this manner. I think they need to organise the back as a team. Walker was out of position for that goal too. Do not be too tough on yourselves spurs. West brom who have been in the shadows for the past 30 years have theit best squad since 78/9 season under Ron Atkinson. The year they hammered man u 5-3 away. West Brom out played Liverpool last week and when lakuku came on he ran their defence inside out. West brom will defy the pundits this season, those who had them down as relegation fodder. These being the same pundits who had both Liverpool and spurs down for convincing wins. I cannot believe that people are criticising the defending of that goal. Spurs were on the ropes at that stage. Spurs had no answer for it, and WBA should have scored BEFORE that goal, and if it hadn't have gone in then, they may have scored AFTERWARDS anyway. It would have been pure luck to escape with 3 points. The problem was WAY before this incident. You are winning the game, AT HOME, and you should either try to get a second goal, or try to close the game out by passing it around, or taking it into the corner. It is worthwhile analysing the goal, but do not neglect HOW it came about. Spurs fan. Spurs scored twice only the ref decided Defoes's goal was offside .. he wasn't. He was indeed offside. No goal. Terrible defending by all concerned but especially Friedel. We had at lest three opportunities to get the ball clear and safe. We could very easily have lost this. We were too deep and had too many defenders doing nothing basically.High line? I wish. I think I've seen this film several times before: dominate but fail to score and lose or draw to an extra time goal. Why two defensive midfielders at home to alleged 'relegation fodder'? Wouldn't surprise me if they finished above us. Why two attackers when one had done absolutely nothing all game. Why not start with Siggy and VDV. Why sell Dawson and keep Gallas other than for financial reasons. Second game running we should have gone in at half time 2 goals up. It's gonna be a turbulant season Andres. The defending was very keystone cops and it had been 3 times prior to this particular cross. Friedel has never been a great commander of his box from memory - and on this occasion his failure once more to assert any kind of authority in his area encouraged a high level of panic in the defenders. The telling point for me was that just after Gallas had headed the ball off the line he seemed to berate Friedel for not stepping a yard or two to his right to catch the ball - which would have been the wisest course of options. This would have calmed things and prevented the goal. I like Friedel but he is far too long in the tooth now to be the number one - bring Hugo Lloris in - please? You forgot to mention the fact that all the while this was going on, Vertonghen TWICE wrestled (literally) Jonas Olsson to the floor in the penalty area, so even if Albion hadn't scored, if Spurs managed to get the ball then the ref would surely have blown for a penalty. Why would the ref have seen that foul when he missed just about every other foul throughout the game? Wish we had lakuku or their peter odemwingie. Reckon west brom have a better choice of strikers to choose from and will finish around spurs or even higher come the end of the season. Tottenham's defending once Lukaku came on was poor - Gallas and Vertonghen couldn't cope with his strength and pace. The goal was coming especially in the final ten minutes. Watch how Vertonghen was taken out by an Albion player as the ball comes in from the cross which leads to the goal. As Bale hacks the ball away, they are wrestling on the ground. I think it's Sigurdsson who tries to reach McAuley's knock back from which Morrison scores. Welcome to the PL Jan!! In their brief stint together in pre season I'm afraid Vertonghen and Kaboul didn't look comfortable together, things got better for vert pairing him with Dawson and Gallas, possibly the reason he and Kaboul weren't paired up straight away. It's just a matter of time of course, and if any silver lining can be found in the recent Kaboul injury it's that Vert can come to terms with the premiership next to a defender he seems more natuarally suited to working with before having to get to grips with playing next to Kaboul. Personally I really hope it also means we keep Dawson as Gallas is looking a little tired and last season began to get on my nerves with his dribbling into advanced midfield without any real direction and a gaping hole behind him, only to lose control of the ball.